Pack the best of tone and power in a single drum kit! The Crush Chameleon Ash drum kit is made with 100% European ash wood shells, to produce wide-ranging, versatile tones that playing any type of music possible. 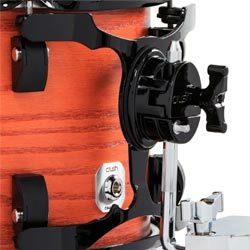 And it's easy to customize your kit, thanks to Crush's proprietary changeable colored lugs and 4-point suspension mounting system for supporting rack toms. Get yourself a versatile kit, fit for any type of music, with the Crush Chameleon Ash. 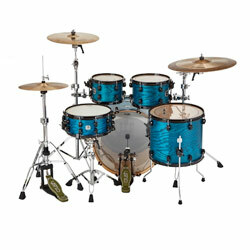 Drummers from every genre are flocking to Crush drums because of the immense versatility that each drum kit delivers. 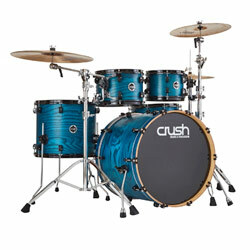 The Crush Chameleon drum kit's ash tonewood produces a clear, punchy attack, wet, heavy tones, and solid, even lows. The drums are outfitted with Remo Ambassador UT heads made with a single layer or 10-mil Mylar. These heads provide bright tone with massive sustain, in tandem with each ash wood shell. Crush packs the most power and tone in each drum, giving you a set fit for any application you throw at it. European ash wood hails from the olive family of trees, and is native throughout the European mainland east of the Caucasus and Alborz mountains. Because of its durability and natural elastic ability, European ash is commonly used in walking sticks for hikers. And thanks to these beneficial factors, this tonewood also makes for amazing drum shells. Ash wood creates increased projection in each drum, yielding crystal-clear attack, even with the hardest hitting of players. This Crush kit's shells have been finished with a satin lacquer, so that each drum's full tonal potential is achieved. The Chameleon Ash kit is outfitted with cutting-edge drum technology fit for the professional drummer -- starting with lug customization. The kit features Crush proprietary changeable colored lugs, which allows the drummer to customize their kit without having to remove the lugs from the shell. Each shell is supported by Crush's 4-point suspension mounting system, which uses two lugs per side without any need for drum shell contact. This creates a more even resonance with each hit. Drum hoops can make or break good drum tone; they affect both projection and the overall construction of each drum. The Chameleon kit's toms feature heavy-duty, triple-flanged hoops, and the snare uses a reverse flange 2.3mm hoop for added strength and projection. Crafting a complete drum kit is essentially to getting your best sound. 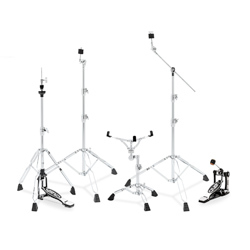 The Crush Chameleon Ash kit goes great with Crush's Chameleon drum hardware package, which includes hi-hat, snare, boom and straight cymbal stands, plus a Crush bass drum pedal. Just like the Chameleon kit that it's supporting, Chameleon hardware is built to last with "road tough" construction -- and it's perfect for gigging musicians, thanks to its lightweight design and scratch-resistant coating. Each stand includes Crush's memory lock technology and heavy-duty rubber feet. Complete your Chameleon Ash drum kit in style with the Crush Chameleon drum hardware pack!